Bahia Mar is ideal for a family or four couples who want to vacation on Taylor Bay. The beach is steps away, the outdoor space is huge, and there are four king suites with private bathrooms. I love staying on the Taylor Bay beach and nearby Chalk Sound and Sapodilla Bay are equally beautiful and tranquil. Plus, you can rent water sports equipment and grab a bite to eat at Las Brisas just minutes away. Beachfront villa in Taylor Bay! 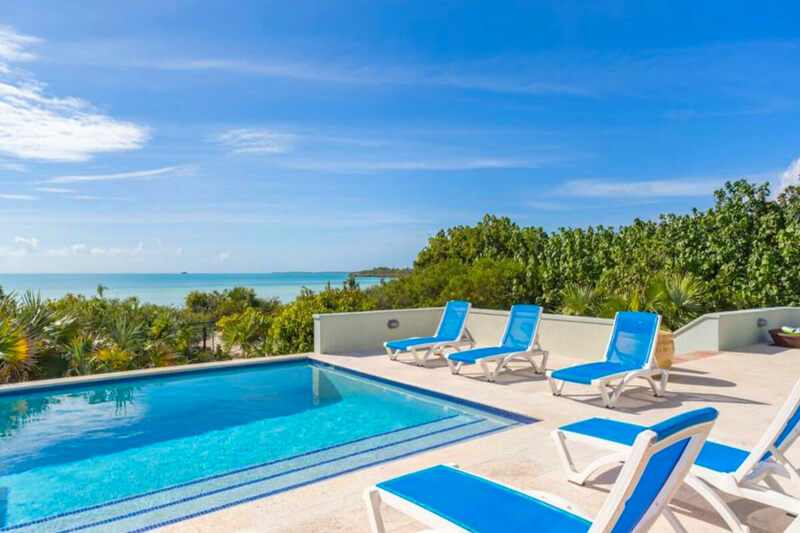 Bahia Mar is a two-story beachfront villa nestled on Taylor Bay Beach in Chalk Sound. Chalk Sound is known for its calm, crystal-clear waters, pristine beaches, and spectacular sunsets. This low-density, residential area guarantees peace and tranquility. The villa’s private pool and lounging deck face the sea, and a propane barbecue grill sets the scene for sunset dinners. A private path leads to the beach and sea, and Bahia Mar provides kayaks, paddle boards, beach chairs, umbrellas, and toys for days by the sea. A screened porch with cushioned sectionals, bar seating, and ceiling fans wraps around the interior common area. Sliding glass doors on every side maximizes the ocean views. Travertine tile floors, customized cabinetry, and colonial furnishings run throughout Bahia Mar’s interior. On the ground floor, there is a fully equipped kitchen with standard appliances, a formal dining area, and a living room. The ground floor also has a king bedroom with an ensuite bathroom. On the upper floor, there are two spacious suites with ensuite bathrooms, and one suite with access to an adjacent bathroom across the hall. These three bedrooms have private air-conditioning and access to the wraparound balcony which overlooks the deck and the sea. All four bedrooms have king beds, although one suite has the option for two twin beds. Bahia Mar is an ideal place to take the entire family. Tennis courts and Chalk Sound are within walking distance, and nearby restaurants are a short drive away. Any AC overage will be metered separately and will charged to guests at market rate. Car rental, private chef, butler, server, daily maid service, grocery and beverage shopping (pre-arrival and during your stay), liquor and wine delivery, nanny service, baby equipment, spa services, yoga and personal training, photography, and private airport transfer/car service can be arranged for an additional fee.